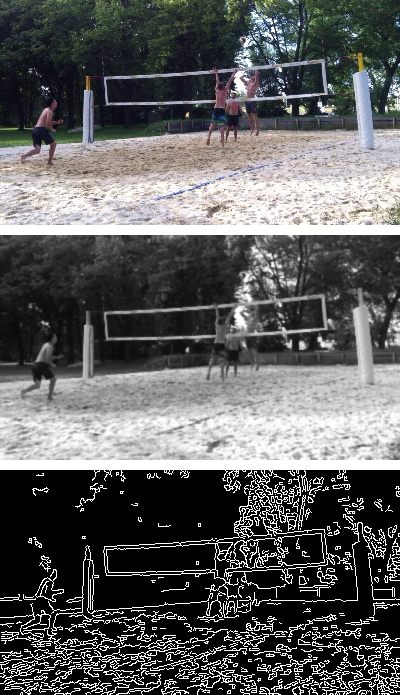 What would be your approach to detecting the volleyball net on this images. I am a struggling with coming up with a decent solution. 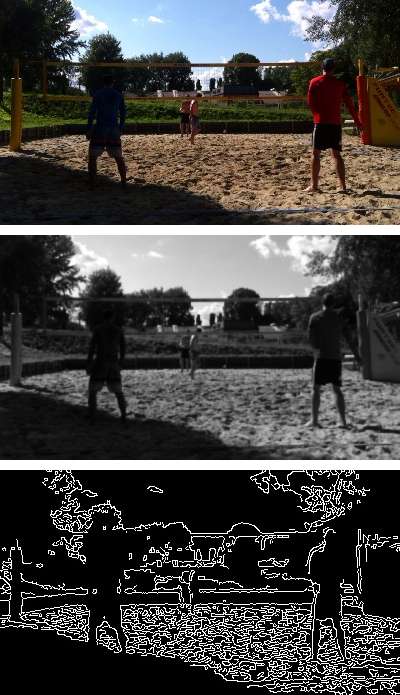 Unfortunately, bilateralFilter or gaussianBlur all result in a lot of noise (especially the trees and sand) for the canny line detector. Can you suggest a better course of action ? Any ideas will be appreciated. Specifically, how to filter out sand and trees. P.S. Also tried inRange based on hue, but the net and the human skin fall within the range of the sand. Will the camera always be on these positions? Nope. On different images camera may be located in different places. The most reasonable assumption to make about position is that the majority of the lower half of the picture is mostly sand and the net is somewhere towards the middle. Well,then your best bet seems like training your own object detector. Try looking at this tutorial. Get just the horizontal and vertical lines, then search for rectangles.